Background: There is an array of clinically and academically derived opinion as to the correct surgical approach to the intermetatarsal space, most frequently to excise a symptomatic interdigital perineural fibroma (aka Morton’s Neuroma). The purpose of this retrospective case series was to evaluate the patient outcomes, and sequelae following a longitudinal plantar incision for excision of interdigital perineural fibroma. Method: This is a retrospective case series of forty-two patients who underwent excision of interdigital perineural fibroma utilizing a longitudinal plantar incision between 2012-2014. All patients were reviewed at two weeks, four weeks and six months post operatively. Patient and clinician outcome measures were captured by means of the Manchester-Oxford Foot Questionnaire (MOXFQ) and Patient Satisfaction Questionnaire 10 (PSQ-10). Results: Forty two patients (forty eight excisions) were assessed both pre operatively and post operatively. 95.2 percent of patients felt their foot was better or much better at six months post operatively. The average post-operative PSQ-10 score was 85.05 (SD +/- 14.3). A significant reduction in all three MOXFQ domains was observed. Four patients had surgical sequelae; only one patient reported no improvement in pain post operatively. No patients reported worsening symptoms. Conclusion: Producing excellent patient outcomes with only minimal complications, this case series substantiates the growing literature showing that excision of interdigital perineural fibroma through a longitudinal plantar incision is both safe and effective. Interdigital perineural fibroma (Morton’s neuroma, interdigital neuroma, Morton’s metatarsalgia) is both a commonly described pathology as well as a frequently encountered affliction. Although commonly affiliated with Thomas Morton’s description of 1876 (Morton, 1876), of only the third intermetatarsal space, arguably historic precedence can be attributed to either Civinini, (1835), Durlacher, (1845) or Tubby, (1912). The incidence of interdigital perineural fibroma (IPF) is three-fold in the middle aged female population in comparison to their male counterparts (Naraghi et al, 2014). Symptoms commonly include paroxysmal pain and paresthesia of the pedal web space (most commonly the third) and adjacent digits. The preferred description of an ‘entrapment neuropathy’ is now frequently utilized (Hassouna & Singh, 2005). Despite the plethora of literature which exists for this common condition, a continuum of disparity regarding its etiology remains. Diagnosis is by a thorough mixture of both symptomology and clinical examination. Musculoskeletal ultrasound and magnetic resonance imaging have been shown to be sensitive diagnostic tools (Sharp et al, 2003). There exists a treatise of nomenclature relating to this condition. Although many historic reports entitle IPF as a ‘tumor’, recent histopathologic studies have formalized its histology as a perineural fibroma (Pazzaglia et al, 1996), that of inflammation and fibroblastic proliferation around a nerve. Despite this, most studies cite an IPF as a benign swelling occurring at the bifurcation of the plantar interdigital nerve. If symptoms of IPF are refractory despite exhausting conservative treatment modalities, then surgical intervention is indicated (Akermark et al, 2008). Numerous surgical approaches and procedures have been described for this condition. Disaccord is prevalent regarding incision placement, particularly whether the incision should be approached dorsally or plantarly (Wilson & Kuwada, 1995). Evidence does not favor any particular approach to incision, despite this, many practitioners surreptitiously avoid a plantar incision due to concerns surrounding cicatrix, particularly hypertrophic scar formation and intractable plantar keratosis (Hassouna & Singh, 2005). This case series highlights the method and outcomes relating to patients (n=42) who underwent complete excision of IPF via a longitudinal plantar incision. Between 2012-2014 consecutive patients (n=97) who had refractory symptoms despite conservative treatment intervention underwent surgical excision. Those patients who had surgery performed utilizing a dorsal approach (n=11), patients who had undergone simultaneous bilateral procedures (n=5) and patients who underwent excision in combination with other surgical procedures (n=9) were excluded from the study. Patients for whom post-operative outcome data was unavailable (n=30) were also excluded. Patients who had undergone excision of a perineural fibroma unilaterally and in isolation were subsequently included (n=42). Successive outcome data for at least 6 months was a prerequisite. All surgery was undertaken or supervised by the second author (IR). Patients were all admitted on a day surgery ambulatory basis. General anesthesia with regional local anesthetic block was used in a minority of patients (4, 9.5%), the majority of patients underwent surgery with regional ‘ankle block’ anesthesia alone. Standard surgical asepsis and infection control measures were observed. Surgery took place within a laminar airflow (Howorth Exflow 90) operating theatre. The procedure was performed utilizing a pneumatic ankle tourniquet set at 80-100 mmHg above the patients’ recorded systolic blood pressure. A longitudinal plantar incision was made (Figure 1). The incision extends from the edge of the adjacent web space distally to just beyond the level of the metatarsal heads proximally. Vessel management was undertaken utilizing bipolar cautery. 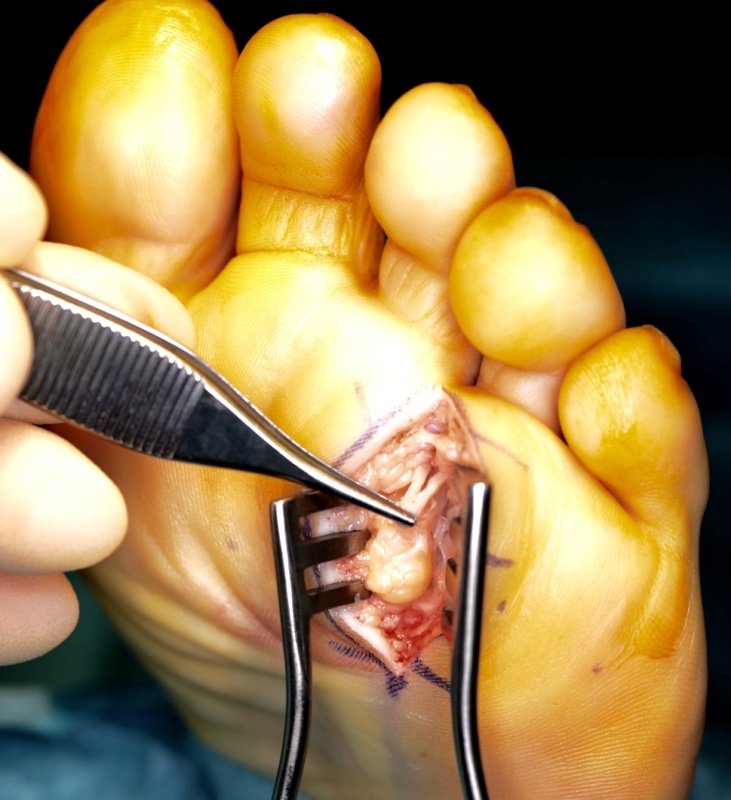 Figure 1 Plantar longitudinal incision. Figure 2 Highlighting digital bifurcation. Figure 3 Proximal tracking of nerve. Utilizing blunt dissection carefully, navigating through the plantar fat pad, the pathological nerve is identified, perineural adhesions were bluntly released ensuring integrity of the surrounding soft tissue architecture. Visualization and adhesion neurolysis was performed distally at the level of digital bifurcation (Figure 2). Proximally blunt dissection was undertaken (Figure 3) until normal nerve diameter and visualization was encountered. The plantar digital nerve was resected distally at its digital bifurcation, and proximally where approximately 10mm of normal nerve had been visualized. The remaining proximal nerve stump was cauterized and displaced proximally. Hemostasis was achieved again using bipolar cautery. The surgical site was then flushed with saline and skin closure achieved with 3-0 monofilament polypropylene suture utilizing a horizontal mattress technique (Figure 4). Protocol for post-operative analgesia included co-codamol 30/500 one or two tablets QDS and diclofenac 50mg TDS (PRN). Co-codamol was replaced for Tramadol 50mg QDS in cases of allergy or intolerance. All patients were placed in a compression dressing utilizing a universal post-operative shoe (Benefoot) for four weeks, during which time they were allowed to weight bear for essential activities of daily living. Patients received a wound review at two weeks and removal of sutures at four weeks. Patients were seen finally for six month review. Patient reported outcome measures were recorded using paper questionnaires both pre-operatively on the day of surgery and post operatively at 6 month review. Pre and post operatively patients were asked to complete the Manchester-Oxford Foot Questionnaire (MOXFQ) (Dawson et al, 2006) and post-operatively. In addition to the MOXFQ, patients completed The Patient Satisfaction Questionnaire 10 (PSQ-10) (Rudge & Tollafield, 2003). Data was inputted electronically to the Podiatric Audit of Surgery and Clinical Outcome Measure (PASCOM-10) system. During post-operative review clinician determined outcome data was also collected. Statistics and calculations were achieved using Microsoft Excel (2010 Microsoft Corporation). Of the patients included in the study (n=42), 33 (78.5%) were female with a mean age of 52.9 (SD +/- 11.8) years (range 28-72) and 9 (21.5%) were male with a mean age of 54.8 (SD +/- 12.8) years (range 44-72). In 25 (59.5%) cases the left foot was involved, leaving 17 (40.5%) incorporating the right foot. Neuromas were excised in isolation in 20 (47.6%) cases from the 3rd intermetatarsal space and 16 (38.1%) from the 2nd intermetatarsal space, 6 (14.3%) cases involved both the 2nd and 3rd intermetatarsal space. Histological confirmation of perineural fibroma was obtained in all samples excised, totaling 48 from 42 feet. (Example of excised sample sent to histology seen in Figure 5). Figure 5 Excised interdigital perineural fibroma. Of the 42 patients in the study, 4 cases of surgical sequelae were recorded. Sequelae were recorded during post-operative visits by the attending clinician utilizing electronic data capture. Of the 4 patients, 2 patients (4.7%) suffered with scar line hypertrophy, one patient required surgical revision of the scar with good long term results at six month follow up. One patient (2.4%) had a suspected stump neuroma at 6 months post op, this patient achieved asymptomatic longevity with one infiltration of 40mg Depo-Medrone, subsequently not requiring further surgery. One patient (2.4%) had a suspected (not proven) superficial infection treated with a 7 day course of antibiotics with no long term negative effect. Patient satisfaction was captured utilizing the PSQ10. At 6 months post-surgery 40 (95.2%) patients felt that their foot was better or much better than compared to the original problem. One patient (2.4%) noted that their foot felt ‘the same’ when compared to the original problem, it was this patient who subsequently required revision of hypertrophic scar formation. One patient (2.4%) did not state how they felt. When asked ‘would you have surgery again under the same circumstances?’, 40 (95.2%) said yes and 2 (4.8%) said no. The majority of patients (13, 31%) were back into preferred footwear by 8 weeks, 2 patients (4.8%) by 2 weeks; 10 (21.4%) by 4 weeks; 12 (28.6%) by 6 weeks with 6 (14.3%) patients waiting until 6 months until they were normally shod. The average PSQ10 score was 85.05 (SD +/- 14.3). Figure 6 illustrates the MOXFQ score distribution across the 3 patient reported outcome domains. 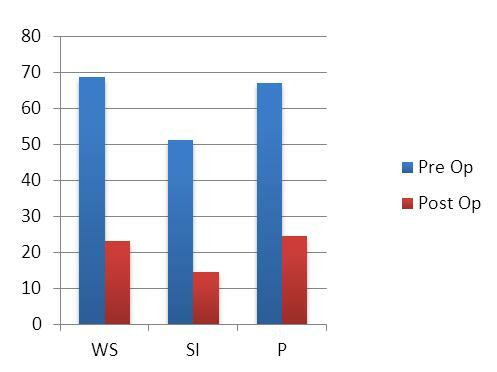 In the walking / standing (WS) domain the average pretreatment score was 68.8 (SD +/- 21.5), the post treatment score reduced to 23.1 (SD +/- 27.4). For social interaction (SI) scores reduced from 51.3 (SD +/- 22.3) to 14.4 (SD +/- 19.5) and in the pain (P) category, 67.1 (SD +/- 18) and 24.6 (SD +/- 22.3) respectively. Scores in each domain exceeded the threshold (WS 12.8, SI 20.3 and P 4.6) for a clinically significant difference as defined by Dawson et al, (2007). Figure 6 Pre/post op comparative MOXFQ distribution. Interdigital perineural fibroma are a common clinical entity, despite this, there remains disparity both academically and subjectively about its etiology, pathophysiology and long term treatment. However it is uniformly agreed that surgical intervention is required once conservative treatment has failed (Akermark et al 2013). Despite this surgical consensus and the vast amount of literature pertaining to it there remains druthers amongst surgeons regarding the surgical approach which should be taken. Numerous approaches to the intermetatarsal space have been described in the literature, including minimally invasive techniques (Zelent at al 2007). Minimally invasive surgical approaches to excision of IPF have been available for a number of years (Barrett & Pignetti, 1996), however such approaches are often utilized when performing procedures alternative to excision of the pathological nerve such as decompression of the deep intermetatarsal ligament (Dellon, 1992). Excision of the fibrosed nerve in toto is the most common procedure of choice (Jain & Mannan, 2013), for this, four main approaches to the intermetatarsal space have been described, which include; the longitudinal plantar, transverse plantar, web space approach and longitudinal dorsal. Patient satisfaction has shown to be high following IPF excision (Thomson et al, 2004). Despite this, reports state satisfaction rates as low as 65% (Nashi et al, 1997) and as high as 100% (Colgrove et al, 2000) utilizing various surgical approaches and methods. As such Thomson’s Cochrane review (Thomson et al, 2004) concluded that there was insufficient evidence to assess formally the effectiveness of both operative and conservative treatment for IPF. Further appraisal of the literature also shows discourse on failure rates following surgical intervention, ranging from 3% (Giannini et al, 2004) to as high as 24% (Younger & Claridge, 1998). Akermark et al (2013) performed one of the first prospective randomized controlled trials providing comparative data for dorsal vs longitudinal plantar approaches to excision of IPF. Patient satisfaction and pain reduction were comparable between both groups. A reduction in daily activity restriction was noted in both dorsal and plantar groups, 67% and 77% respectively. 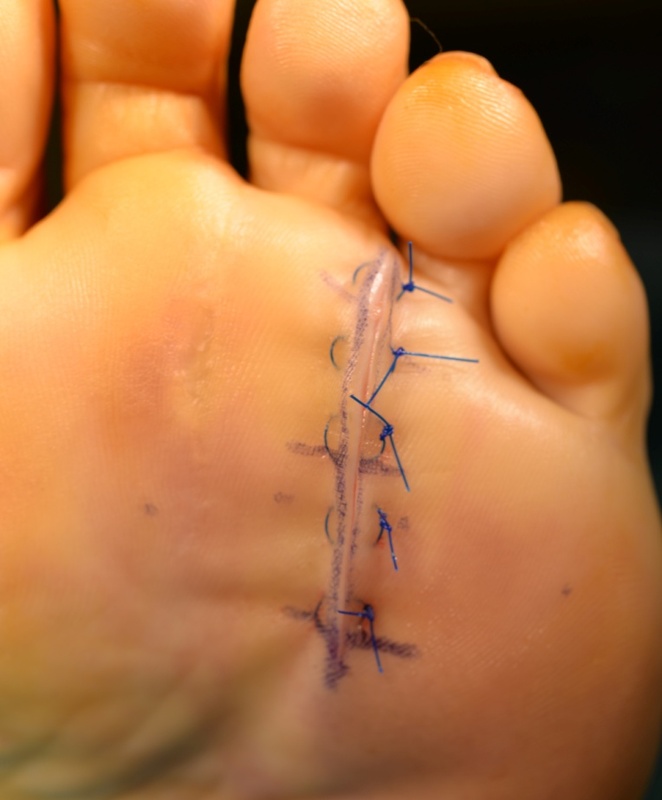 Pain reduction was 96% in the plantar incision group and 97% in the dorsal group. Other studies citing similar satisfaction rates are available. Akermark et al, (2008) in an earlier study found 86% satisfaction rates following plantar incision, Jerosch et al, (2006) showed 92% satisfaction following longitudinal plantar incision. Wilson & Kuwada, (1995) in a 15 year follow up study of 29 patients (59 neuromas) found preference for the plantar transverse incision when compared to a dorsal incision, with 68% satisfaction rate following dorsal incision and 100% satisfaction in the plantar approach group. Barbosa et al, (2005) & Nery et al, (2012) also advocated a plantar transverse incision reporting 89.5% and 89.4% satisfaction respectively. Similar favorable data exists for surgery performed utilizing a longitudinal dorsal incision. Lee et al, (2011) followed patients over 10 years, 61.4% of patients were completely satisfied, however they broke down a further 38% that were satisfied with reservations, totaling an overall 99.4% satisfaction rate. Coughlin & Pinsonneault, (2001) using a median follow up of sixty nine months found patient satisfaction high at 84% of 66 patients (74 neuromas), good / excellent results were also compiled into satisfaction rates in studies by Giannini et al, (2004) and Kasparek & Schneider, (2013) citing 77% and 76.5% respectively. Whilst no significant difference has been concluded in the literature, particularly that comparing multiple surgical approaches (for which there are few) patient satisfaction does seem to be slightly higher in those studies utilizing the plantar incision (both longitudinal and transverse). Two very recent studies are also showing high patient satisfaction rates following the plantar approach (Killen et al, 2015 & Kundert et al 2015), this study adds to that data, showing a patient satisfaction rate of 95.2%. Despite there being no significant difference in patient outcomes with either approach, as noted previously in this article, there seems to be a subjective preference for dorsal incision due to concerns regarding surgical sequelae (McKeever, 1952). Whilst concern is derived from the notion of increased risk of intractable plantar keratosis and hypertrophic scarring following a plantar approach to excision of IPF, there remains a multitude of literature showing relatively comparable rates of surgical sequelae for both dorsal and plantar approaches. Akermark et al, (2013) studied 97 patients and found 5 complications following IPF excision through a plantar incision and 6 through a dorsal incision. 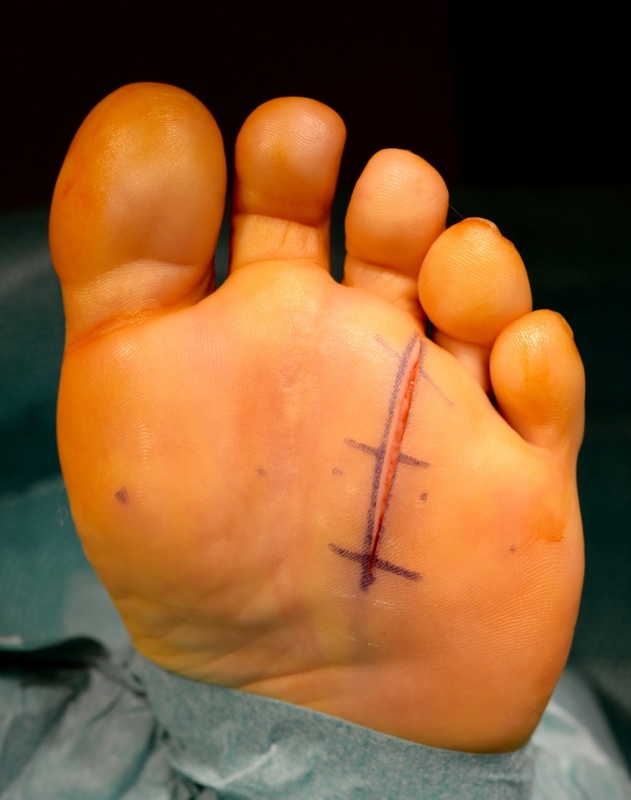 Of the plantar group three cases of small ‘pea sized’ hypertrophic scar formation and one large hypertrophic scar were noted, all were revised with superficial excision and included in the final satisfaction results. Of the 6 complications from the dorsal group these included one resected artery as oppose to IPF (confirmed by histology), one infection, one dehiscence, one deep vein thrombosis and two patients with recalcitrant pain requiring revision surgery through a plantar incision. Patients reported sensory loss 85% of the time in the dorsal group compared to 66% in the plantar group. Jerosch et al, 2006 noted 2.8% of patients with problematic scars and 1.7% infection in a large cohort of 356 patients. Barbosa et al, 2005 found one patient of a nineteen cohort to have dehiscence, with no further complications cited. Kundert et al, 2015 in a midterm follow up study also found favorable scar sequelae with a 5.3% symptomatic scar rate in 51 feet. Like Akermark et al, (2013), Wilson & Kuwada, (1995) compared complication rates between both dorsal and plantar approaches, in a 15 year follow up they found a 6.7% complication rate for plantar incision and a 17% complication rate for the dorsal approach. Similar to Akermark et al, (2013) the plantar group had two cases of problematic scar formation; however, this mirrored the dorsal group who also reported two patients with pathological scar formation. 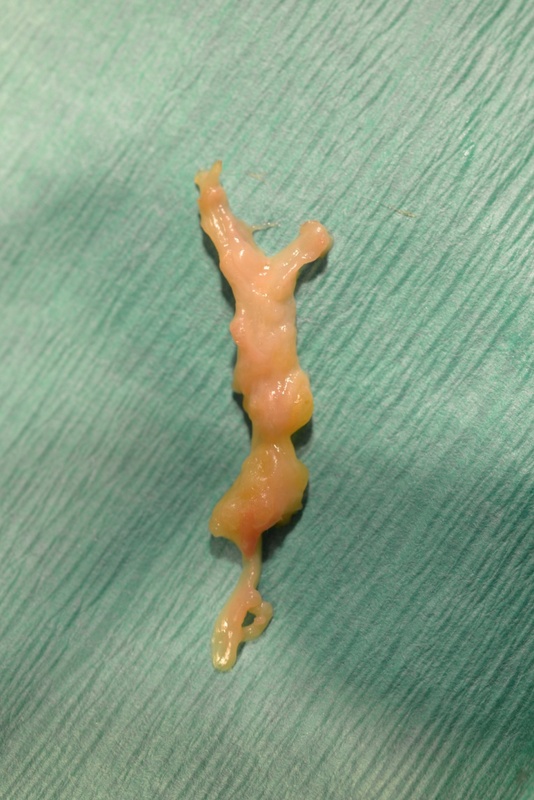 In addition to the two patients suffering with scar tenderness, the dorsal group also had six reported cases of recurrent neuroma, one hematoma and one deep vein thrombosis. Nery et al, (2012) found a lower incidence of complication compared to other studies (6.9% patients reported a ‘fair result’), however unlike other studies focusing on plantar incisions they had a 3.8% stump re-occurrence, confirmed via histology following revisional surgery. 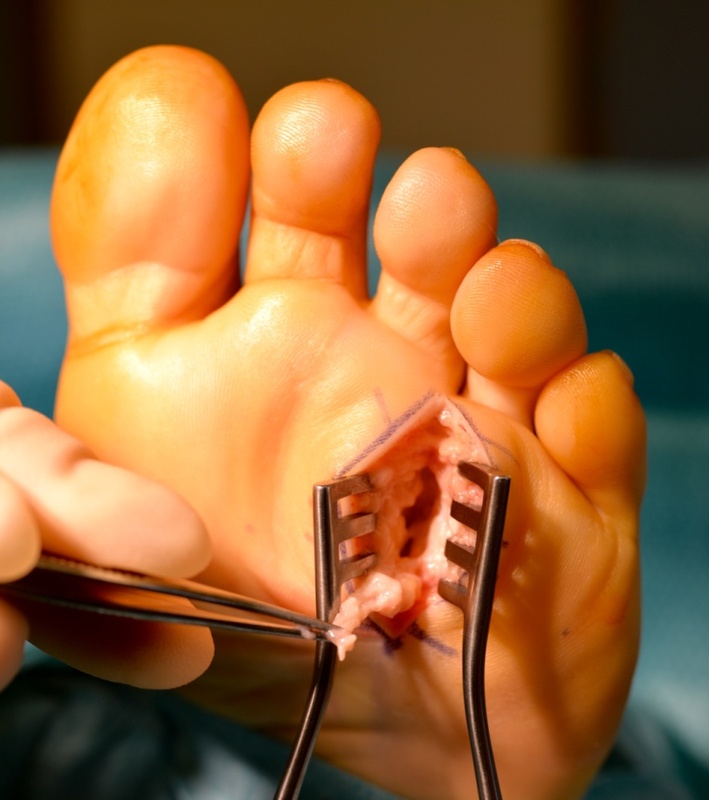 Studies focusing on the longitudinal dorsal approach show no significant difference in complication rates when compared to plantar incision, however the specific type of surgical sequelae differs with approach. Lee et al, (2011), Wilson & Kawada, (1995) and Akermark et al, (2013) all report significant discomfort related to sensory loss following IPF excision through a dorsal approach with two of these studies directly comparing dorsal and plantar incisions. The results of the two studies (Wilson & Kuwada, (1995) & Akermark et al, 2013) which directly compare multiple surgical approaches have already shown the surfeit of sequelae which may arise following a dorsal approach, in addition to this, Coughlin & Pinsonneault, (2001) also found problems related to ‘uncomfortable’ paresthesia post operatively as well as six superficial infections, one deep infection, a case of complex regional pain syndrome and adjacent metatarsophalangeal joint instability. In this case series the complication rate deduced was 9.6% (4 patients) which averaged between the literature scrutinized, however given the small sample size an elevated complication percentage is expected. Of the four patients with complications, two patients had satisfactory outcomes, one patient chose not to comment and one patient (2.4%) was deemed to have a failed outcome; ultimately culminating in a 95.2% satisfaction rate. Whilst we have shown that there is a risk of cicatrix’s following surgery approached through the plantar surface of the foot, research infers that there is no evidence to suggest inferior patient outcomes following this approach, particularly when compared to alternative surgical approaches. In fact the risk of adverse scarring following this approach is comparable with data derived from cohorts utilizing a dorsal incision, thus negating the argument of mechanically induced scar hypertrophy. In fact an interesting outcome of the Coughlin & Pinsonneault, (2001) study was the 15% incidence of post-operative intractable plantar keratosis development around an adjacent metatarsophalangeal joint following a dorsal incision. This could be a potential side effect of division of the deep intermetatarsal ligament, which requires further research in the future. This case series produced excellent patient outcomes, in common with recent literature; a significant reduction in pain with increased mobility and social inclusion. The existing literature already justifies the longitudinal plantar approach to excision of intermetatarsal perineural fibroma, showing a low (and less varied) complication rate: this case series substantiates this. Akermark, C., Crone, H., Skoog, A., Weidenhielm L. (2013). A Prospective Randomized Controlled Trial of Plantar Versus Dorsal Incisions for Operative Treatment of Primary Morton’s Neuroma. Foot Ankle Int, 34 (9), pp.1198–1204. Åkermark, C., Saartok, T., Zuber, Z. (2008). A prospective 2-year follow-up study of plantar incisions in the treatment of primary intermetatarsal neuromas (Morton’s neuroma). Foot and Ankle Surgery, 14(2), pp.67–73. Barbosa, G., Tiragentes, G., Ignacio, H., Filho, G., Chueire, A. (2005). Surgical Treatment of Morton’s Neuroma by Plantar Approach: A Retrospective Study. Acta Ortop Bras, 13(5), pp.258-260. Bauer, T., Gaumetou, E., Klouche, S., Hardy, P., Mafulli, N. (2014). Metatarsalgia and Morton’s Disease: Comparison of Outcomes Between Open Procedure and Neurectomy Versus Percutaneous Metatarsal Osteotomies and Ligament Release With a Minimum of 2 Years of Follow-Up. The Journal of Foot and Ankle Surgery, pp.1–5. Betts, L. (1940). Mortons Metatarsalgia; neuritis of the 4th digital nerve. Med J Aust, 1, pp.514-5. Brosky, T., Burchill, C. (2014). Plantar approach for neuroma excision. McGlamry’s Comprehensive Textbook of Foot & Ankle Surgery. Electronic update Chapter 6, pp.31–4. Available at; http://www.podiatryinstitute.com/pdfs/Update_2014/2014_06.pdf. Ciapryna, M., Palmer, S., Alvey, J. (2012). A patient derived outcome study following surgical excision of Mortons Neuroma of the foot. Journal of Bone & Joint Surg (Br), 94-B, p.76. Civinini, F. (1835). Su di un gangliare rigonfiamento della pianta del piede. Mem Chir Arcispedale di Pistoia. Colgrove, R., Huang, E., Barth, A., Greene, M. (2000). Interdigitial neuroma: Intermuscular neuroma transposistion compared with resection. Foot & ANkle International, 21(3), pp.206-211. Coughlin, M., Pinsonneault, T. (2001). Operative Treatment of Interdigital Neuroma. A long term follow up study. Journal of Bone & Joint Surgery, 83(9), pp.1321-1328. Dawson, J., Coffey, J., Doll, H., Lavis, G., Cooke, P., Herron, M. (2006). A patient-based questionnaire to assess outcomes of foot surgery: validation in the con- text of surgery for hallux valgus. Qual Life Res, 15, p.1211. Dawson, J., Doll, H., Coffey, J., Jenkinson, C. (2007). Responsiveness and Minimally Important Change for the Manchester-Oxford Foot Questionnaire (MOXFQ) Compared with AOFAS and SF-36 Assessments Following Surgery for Hallux Valgus. Osteoarthritis and Cartilage, 15, pp. 918-931. Dellon, A. (1992). Treatment of Morton’s Neuroma as a nerve compression. The role of neurolysis. Journal of the American Podiatric Medical Association, 82(8), pp.399-402. Giannini, S., Bacchini, P., Ceccarelli, F., Vannini F. (2004.) Interdigital Neuroma: Clinical Examination and Histopathologic Results in 63 Cases Treated with Excision. Foot & Ankle International, 25(2), pp.79–84. Hassouna, H., Singh, D. (2005). Morton’s metatarsalgia: Pathogenesis, aetiology and current management. Acta Orthopaedica Belgica, 71(6), pp.646–655. Jerosch, J., Schunck, J., Khoja, A. (2006). Results after Morton’s neuroma resection via plantar approach. Foot and Ankle Surgery, 12(3), pp.133–137. Kasparek, M., Schneider, W. (2013). Surgical treatment of Morton’s neuroma: clinical results after open excision. International Orthopaedics, 37(9), pp.1857-1861. Lee, K., Kim, J., Young, K., Park, Y., Kim, J., Jegal H. (2011). Long-Term Results of Neurectomy in the Treatment of Morton’s Neuroma: More Than 10 Years’ Follow-up. Foot & Ankle Specialist, 4(6), pp.349–353. McKeever D. (1952). Surgical Approach for Neuroma of Plantar Digital Nerve (Morton’s Metatarsalgia). The Journal of Bone and Joint Surgery, pp.490. Morton, T. (1876). A peculiar and painful affection of the fourth metatarso-phalangeal articulation. American J Medical Science, 71 (4), pp.37–45. Naraghi, R., Bryant, A., Slack-Smith, L. (2014). Description of Total Population Hospital Admissions for Morton’s Metatarsalgia in Australia. Journal of The American Podiatric Medical Association, 104(5), pp.451-454. Nashi, M., Venkatachalam, A., Muddu, B. (1997). Surgery of Morton’s neuroma: dorsal or plantar approach? Journal of RCS (Edin), 42, pp.36-7. Nery, C., Raduan, F., Del Buono, A., Asaumi, D., Maffuli, N. (2012). Plantar Approach for Excision of a Morton Neuroma. A Long-Term Follow-up Study. The Journal of Bone and Joint Surgery, 94(7), p.654 – 8. Pazzaglia, U., Moalli, S., Gera L. (1996). Morton’s neuroma : an immunohistochemical study. The Foot, 6, pp.63–65. Rudge, G., Tollafield, D. (2003). A critical assessment of a new evaluation tool for podiatric surgical outcome analysis. British Journal of Podiatry, 6(4), pp. 109-119. Schreiber, K., Khodee, M., Poddar, S. (2011). What is the best way to treat Morton’s neuroma ? Journal of Family Practice, 60(3), pp.157–159. Singh, S., Loli, J., Chiodo, P. (2005). The surgical treatment of Morton’s neuroma. Current Orthopaedics, 19(5), pp.379–384. Sharp, J., Wade, C., Hennessy, S., Saxby, S. (2003) The role of MRI and ultrasound im- aging in Morton’s neuroma and the effect of size of lesion on symptoms. Journal of Bone & Joint Surg Br, 85, pp.999–1005. Thomson, C., Gibson, J., Martin, D. (2004) Intervention for the treatment of Morton’s Neuroma (Review). The Cochrane Library. Chichester: Wiley. Tubby, A. (1912). Deformities including diseases of the bone and joint. Mac Millna Co, Londra. Valero, J., Gallart, J., Gonzalez, D., Deus, J., Lahoz, M. (2015). Multiple Interdigital Neuromas: A Retrospective Study of 279 Feet With 462 Neuromas. The Journal of Foot and Ankle Surgery, 54(3), pp.320–322. Wilson, S., Kuwada, G. (1995). Retrospective study of the use of a plantar transverse incision versus a dorsal incision for excision of neuroma. The Journal of Foot and Ankle Surgery, 34(6), pp.537–540. Younger, A., Claridge R. (1998). The Role of Diagnostic Block in the Management of Morton’s Neuroma. Canadian Medical Association, 41(2), pp.127–130. Zelent, M., Kane, R., Neese, D., Lockner, W. (2007). Minimally Invasive Morton’s Intermetatarsal Neuroma Decompression. Foot & Ankle International, 28(2), pp.263–265. This entry was posted in Uncategorized and tagged fibroma, interdigital perineural fibroma, neuroma, soft tissue mass. Bookmark the permalink.